On one side of Grand Avenue is the former Trinity Auditorium/Embassy Hotel (831 Grand) and the former stomping grounds of old friend downtown dog. Following the cancellation of a Gansevoort Hotel, the owners, New York developer Chetrit, have continued to re-assure everyone that another hotel is coming to the site. Now a reader emails this report: "I was walking by a couple of Saturdays ago, and one of the doors to the theatre was open. I walked in and they were doing a lot of work...All of the seats had been removed, and it appeared that the floor had been filled (essentially making it a flat surface, although I am not 100% sure). Something is going on..." Work inside the hotel may or may not be surprising, given there are often interior tinkerings going on at these empty buildings. But take into account this news! Across the street is 844 Grand, site of parking lot. On Tuesday, a source who works in the area told us testing had recently been done on the site. This source says engineers who did the testing told him that condos are planned for this parking lot. And the crazy part? 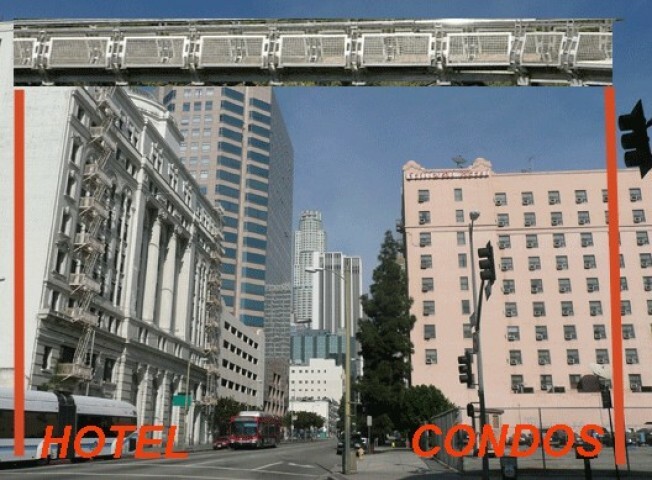 "Chetrit is going to build a sky bridge connecting the condos with the hotels/condos across the street," he said. We went down and took a photo of the place where this guy said the testing took place--it's the hole with the plastic cover thing over it. No one at Chetrit returned our calls. So it's all speculation, really. And possibly all just rumor. But that's what this source was told. And it's an excellent excuse for a Photoshop job. Also in the gallery: A couple of interiors of the old Trinity Auditorium. Hard to tell what exactly is going on.